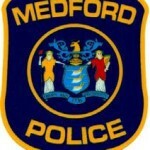 On Jan. 20 at 6:48 a.m., Medford Police were dispatched to a residence on Maine Trail for two vehicles that were broken into overnight. Both vehicles were reported to be un-secured, parked in the driveway of the residence. An unknown person(s) gained entry to the vehicles and removed a black iPhone 6, credit cards, a GPS unit, and loose change. This incident is currently being investigated by the Medford Township Police Department. Anyone with information related to this active investigation can contact the Medford Township Police Department or the Medford Township Citizen Tipline at (609) 714–0302.